When slavery was abolished in New York state on July 4, 1827, a massive celebration was staged on Staten Island at the Swan Hotel on Richmond Terrace. Accounts of the time note rooms had been reserved for months in advance by abolitionists and prominent free blacks. The two-day event in West New Brighton featured speeches, picnics, pageants and fireworks to mark this milestone in the life of New York state. Eight months later, on Feb. 23, 1828, another milestone would be recorded here when Capt. John Jackson purchased land in Westfield—now Rossville. His was the first recorded purchase of land by a black man in Richmond County, and the first purchase of land in the area we know today as Sandy Ground, the oldest community established by free slaves in North America. By the 1830s, freed men and women from all over New York state, as well as from areas as far away as Maryland and Virginia, would follow Jackson’s lead, settling on Staten Island as an oasis from persecution. After abolition in 1827, freedmen from all over the state and as far away as Maryland and Virginia settled in the area known since colonial times as Sandy Ground, in the area around what is now the intersection of Bloomingdale and Woodrow Roads in Rossville. These early settlers were already skilled in the oystering trade. Oyster harvesting was a major business on Staten Island during the 19th century and was mainly conducted on the island’s south shore. The area of Prince’s Bay was the main hub and was within walking distance from Sandy Ground. Sandy Ground also served as an important stop on the Underground Railroad, and is the oldest continuously settled free black community in the United States. 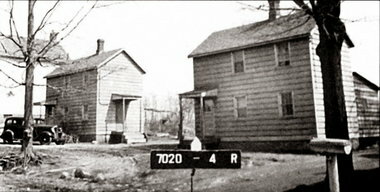 Sandy Ground was one of several similar neighborhoods in urban centers in the Northeast where free blacks gathered to further themselves socially and economically. Other African American communities created in cities with growing job markets in the same time period include the northern slope of Boston’s Beacon Hill, Little Liberia in Bridgeport, Connecticut and Hard Scrabble in Providence, Rhode Island. Although remnants of the original settlement still exist, most of the original houses were destroyed in the Rossville Fire of 1963. The Sandy Ground Historical Society, which preserves the history and physical surroundings of the Sandy Ground community and maintains a museum and library, was organized on February 28, 1980, and is located at 1538 Woodrow Road. In 1982, the Sandy Ground Historic Archeological District was added to the National Register of Historic Places. The Sandy Ground settlement was known at times as Harrisville and “Little Africa.” The community began as a farming region, but as men and women from Maryland and Delaware migrated to the area, the economy shifted to oyster harvesting. The oyster harvesting industry was a major business here in the 19th century, and the oysters the men of Sandy Ground planted and raked in were sold in the finest restaurants in Manhattan and elsewhere. In the midst of this thriving community, which became the center of economic and social life for free blacks living on the Eastern Seaboard, the Zion African Methodist Episcopal Church was formed on Dec. 5, 1850, in the Rossville home of William H. Pitts, who also served as the first minister. The Founding members of the Rossville A.M.E. Zion Church were Caesar Jackson, Francis Williams, William Webb, William H. Stevens, John J. Henry, Moses K. Harris, Israel Pitts, Isaac Purnell, Ishmael Robins, Henry Jackson, Elizabeth Titus, Sarah J. Landin, Esther V. S. Purnell, Ann M. Bishop, Grace Williams and Louisa Harris. The first church was built of frame construction in 1854 off Bloomingdale Road in Bogardus Corners. It was destroyed by fire and replaced by the current building, which was occupied on Dec. 19, 1897, although, some sources state 1870 as the date of this structure’s completion. Sandy Ground also was a major stop along the Underground Railroad for slaves escaping from the South. It has been speculated that the aforementioned Capt. Jackson might have ferried slaves across the Kill van Kull between Staten Island and New Jersey aboard the ferry boat he owned and operated. A group of abolitionists also called Staten Island home, many in the Livingston section, and other houses in addition to those in Sandy Ground have been identified as possible stops along the railroad. Among these might have been the large home built for George W. Curtis at the corner of Henderson and Bard Avenues. Curtis, who wrote for and was associate editor of Putnam’s Magazine, as well as Harper’s Weekly, was an orator of national renown on many subjects, including the ending of slavery in the United States of America. One of the more interesting families to live there was the Harris family. 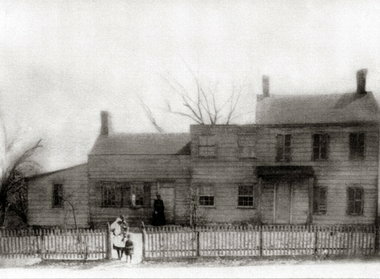 The circa 1906 home of Isaac Harris still stands on Bloomingdale Road. He was the son of Silas Harris, one of two brothers who settled in Sandy Ground with their families early in its history. The Isaac Harris house was designed by renowned architect Stanford White of the firm of McKim, Meade and White. Harris was a respected member of White’s household staff, and it is said the architect drew up plans for Harris’ house as a gift in tribute for his service. The house boasts a gambrel roof and front bay. Unfortunately, Harris’ is one of only about 12 of the original old homes still standing in the community. Older native Islanders will remember the devastating brush fires that raged across the Island on a dry, spring day in 1963. Quite a number of buildings were destroyed in that one-day inferno, many of them in Sandy Ground. But the spirit of the community lived on. The Rossville A.M.E. Zion Church still plays a prominent role in the life of this part of Staten Island. The lovely wood-frame structure is reminiscent of the days when Staten Island was a bucolic place to live and raise a family. The rich history of Sandy Ground has been documented and preserved through the efforts of the Sandy Ground Historical Society. Many families still live in the community that was founded by their courageous ancestors.